Vanlife. Illustration by Justine Shirin, created using Pixelmator Pro. 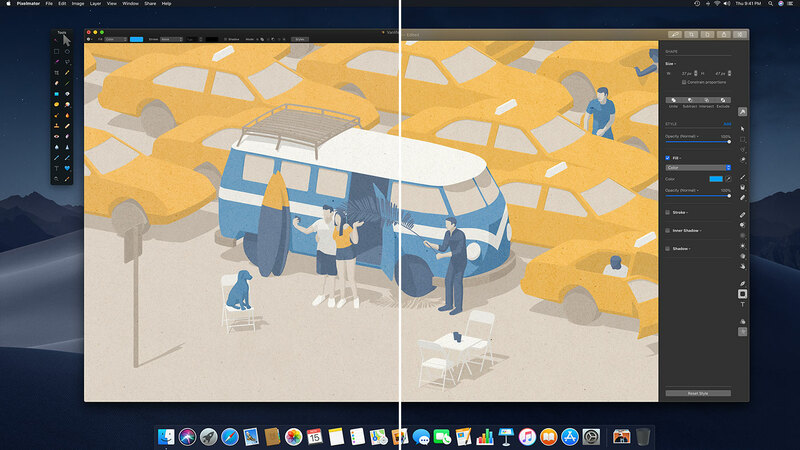 Pixelmator Pro has a completely new design — it has a single-window, fully Mac-native interface. Layers are now on the left, tools on the right, and the overall workflow is much more user-centered. We’ve also added a beautiful light appearance, which was an often-requested feature with the original Pixelmator. There are smaller (but equally awesome) things as well, like the ability to completely hide the interface, intelligent auto-centering (and the ability to scroll beyond the edges of the canvas), a redesigned photo browser, and more. We also have a whole bunch of plans for improving the interface and workflow of Pixelmator Pro and having a completely new design opens up some very exciting possibilities. Things are only going to get better. Resizing in Pixelmator Pro is nondestructive (so if you scale something down and decide to scale it back up later, you won’t lose quality). It’s one of those things you might not really notice at first, but once you get used to it, you’ll wonder how you ever lived without it. We’ve added completely new alignment and distribution tools to make it easier to even out the spacing between objects. The Layers sidebar has two different views — Thumbnails and List — which you can choose between based on whether you like more text or image-based layer organization. And the Core ML-powered automatic layer naming feature automatically detects the contents of images you add and gives descriptive names to your layers. All great features new to Pixelmator Pro. In terms of painting tools, Pixelmator Pro has a completely new, Metal-powered painting engine that brings the same great painting experience we created in Pixelmator for iOS to the Mac, with customizable dual texture brushes, full support for graphics tablets (including the ability to adjust brush opacity using pen pressure), dynamic paint blending, watercolor brushes, and more. The effects are nondestructive. There are new effects, like Box, Disc, and Spin blurs, a Bokeh filter, as well as new Image and Pattern fills. You can save combinations of effects as presets, share them, use any effect or combination of effects for batch processing, and easily copy effects from layer to layer. All things the original Pixelmator doesn’t have.